Rel is an American 30 minute scripted comedy television series, which kicked off on September 9, 2018, on FOX and is broadcast every Sunday at 21:30. The show is currently in its 1st season. FOX opted not to pick up Rel for Season 2. Rel officially canceled on FOX. Sign up to track down your favorite TV shows. 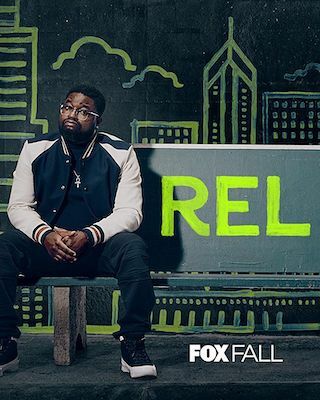 Rel is a multi-camera comedy starring Lil Rel Howery as a successful, hardworking father and husband on the West Side of Chicago, whose life is perfectly on track. That is, until he finds out his wife is having an affair with his own barber - the worst person for your wife to sleep with, because as hard as it is to find love, it's even harder to find a good barber. Now separated, and with his son and daughter having moved to Cleveland with their mother, Rel must begin the difficult task of rebuilding his life as a long-distance single dad. Offering Rel support are his best friend and unfiltered sounding board, Brittany, and his recently out-of-jail, excitable and overly encouraging younger brother, Nat, as well as his prideful and recently widowed Dad, who finds both his sons deep disappointments. As Rel works to repair his life, he often finds himself the victim of his own well-intentioned hubris. He is the "Icarus" of Chicago's West Side - repeatedly flying too close to the sun and getting burned. But, ever the optimist, he always dusts himself off to try again.